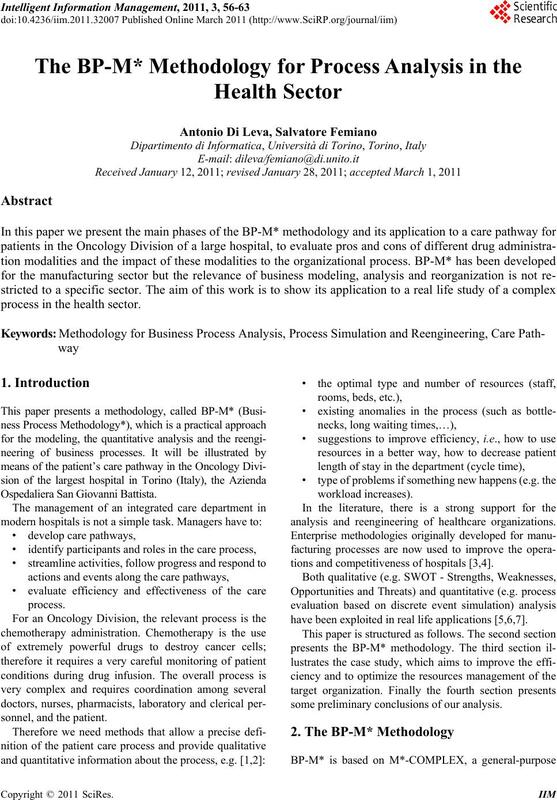 process in the health sector. 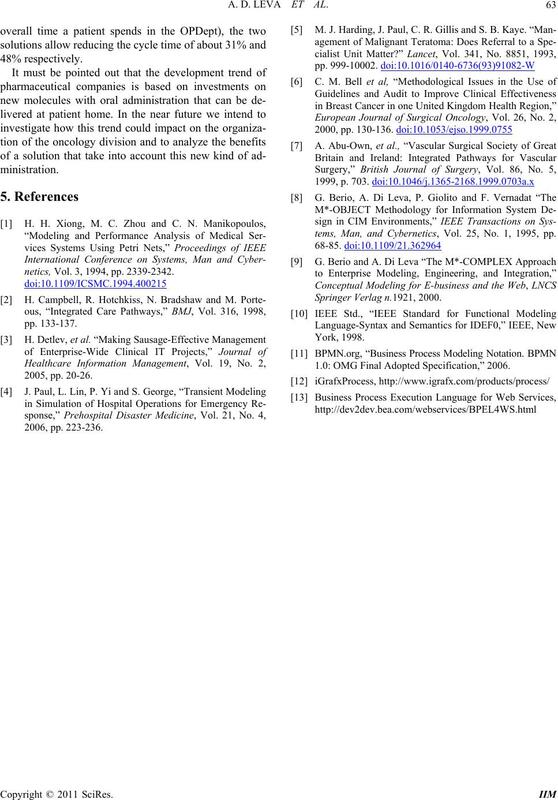 analysis and reengineering of healthcare organizations. tions and competitiveness of hospitals [3,4]. have been exploited in real life applications [5,6,7]. some preliminary conclusions of our analysis. der to support strategic evolution. organizational compone nts which will be investigated. world from two orthog onal p oints of view. Figure 1. The BP-M* overall architecture. are carried on by work centers. flow of actions and are triggered by stimuli called events. performed at a time for achieving process objectives. the resources which are used to execute them. A. D. LEVA ET AL. and new requirements collected during the diagnosis. called To-Be model, i.e. the set of restructured processes. ties (durations, costs, resource consumption). tasks will not be discussed in this paper. 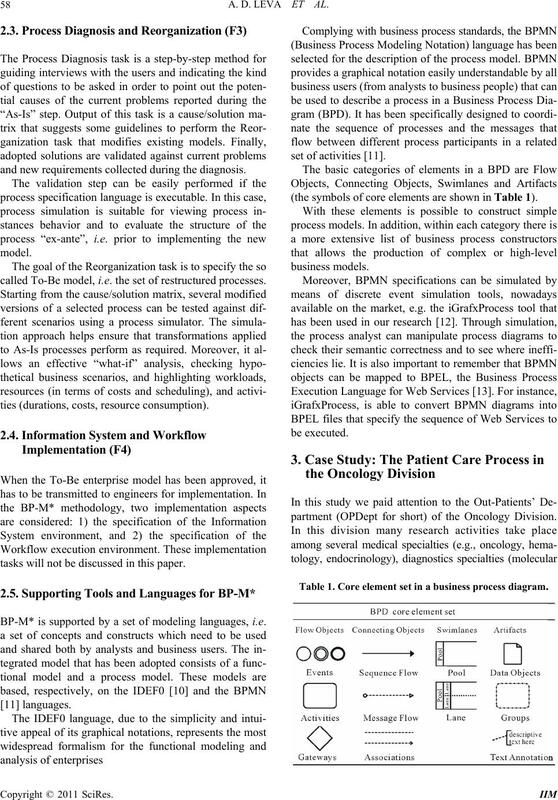 BP-M* is supported by a set of modeling languages, i.e. (the symbols of core elements are shown in Table 1). partment (OPDept for short) of the Oncology Division. Table 1. Core element set in a business process diagram. the care of all solid tumors are administrated. process in the OPDept can be summarized as follows. A patient is accepted and is prepared for blood test. 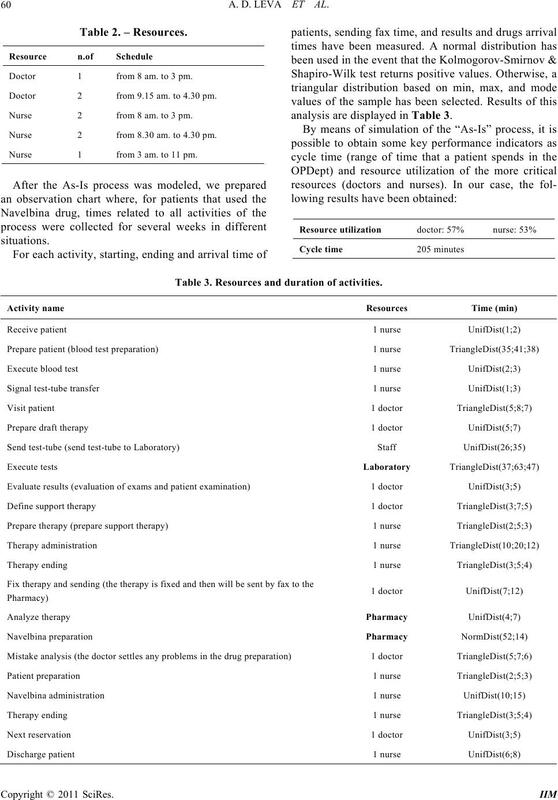 the chemotherapy to optimize waiting times. 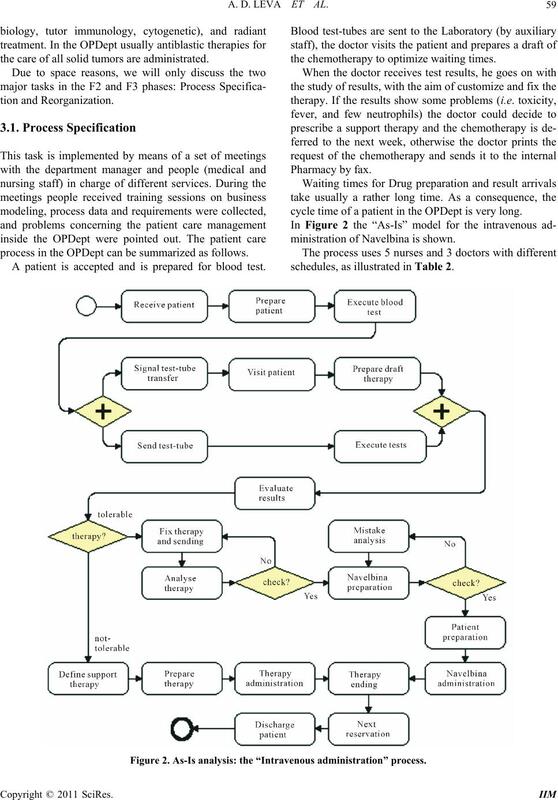 cycle time of a patient in the OPDept is very long. ministration of Navelbina is shown. schedules, as illustrated in Table 2. Figure 2. 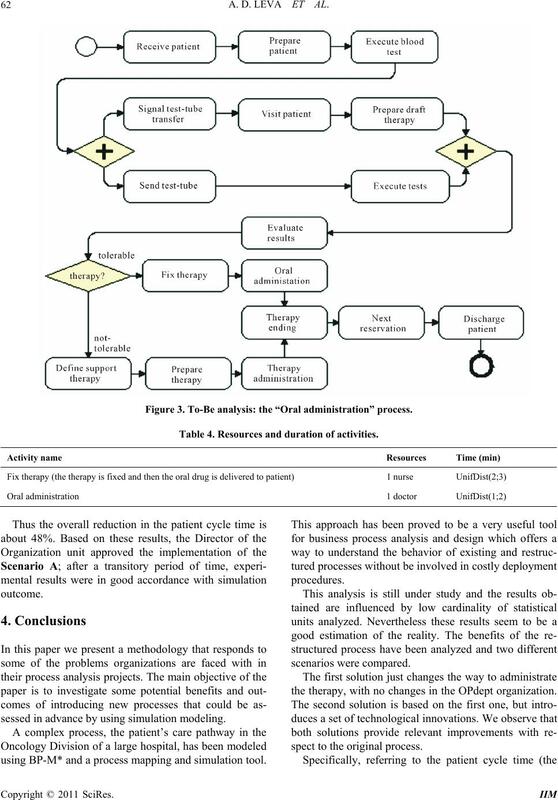 As-Is analysis: the “Intravenous administration” process. Doctor 1 from 8 am. to 3 pm. Doctor 2 from 9.15 am. to 4.30 pm. Nurse 2 from 8 am. to 3 pm. Nurse 2 from 8.30 am. to 4.30 pm. Nurse 1 from 3 am. to 11 pm. analysis are displayed in Table 3. Table 3. Resources and duration of activities. apy, all resources turn out to be heavily used. • Test-tube transport from OPDept to Laboratory. • Test result availability notification. this would result in a considerable save in transport time. result availability with queries to a software application. from the current 26-35 minutes to about 4-5 minutes. • Transmission of therapy requests. • Drug preparation and transport. ized procedure in place of the fax procedure. and delivery times can be eliminated. tion of the drug has bee n intr od uced. sults can deliver the oral chemotherapy to the patient. Figure 3. 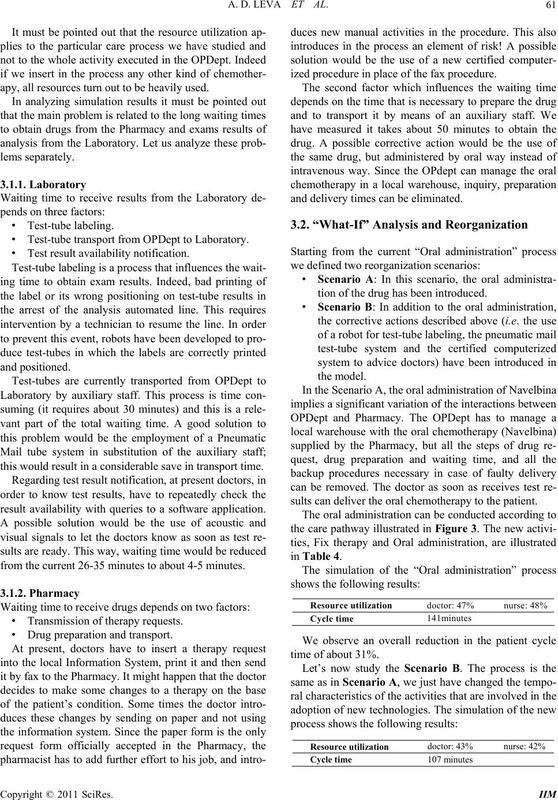 To-Be analysis: the “Oral administration” process. Table 4. Resources and duration of activities. sessed in advance by using simulation modeling. 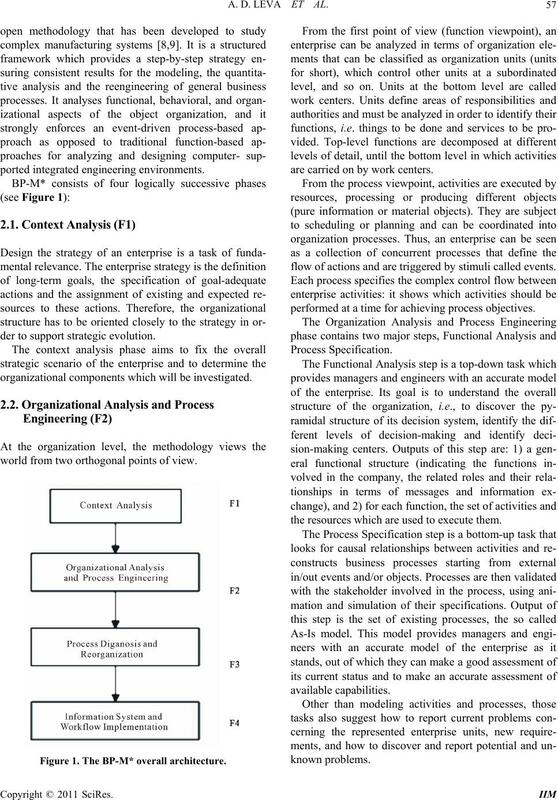 using BP-M* and a process mapping and simulation tool. the therapy, with no changes in the OPdept organization. spect to the original process. netics, Vol. 3, 1994, pp. 2339-2342.
tems, Man, and Cybernetics, Vol. 25, No. 1, 1995, pp. 1.0: OMG Final Adopted Specification,” 2006.